Olney doc muses: Medicine, vinyl and me. 1. The sleeve or covers are just great. Imaginative, clever and atmospheric. When I see the cover I immediately connect with the content, and even some memories of listening to it previously. 2. It's good to have the lyrics within the sleeve. For all the best music is enhanced by the words, and the words are given extra power by the music. 3. Vinyl just needs more engagement and effort and is all the better for that. Not always of course, but often enough to make it worthwhile. I have to physically and carefully place the stylus, and I have to get up every 25 minutes or so to change the side. How short they seem now in the age of streaming. 4. Many people comment that there is a clarity to the sound. I'm not sure about that although with the ear of faith I maybe just get what they are saying. 5. After a while vinyl shows its age. A certain amount crackling noise appears or even the sound of a fine scratch. Somehow it seems more authentic (ok at times annoying for all that). Yea, but what has that got to do with medicine? Well treating patients is never just one dimensional. It's not just about the surgery or the drugs, but it's about the whole interaction between the doctor, the patient and the whole team. 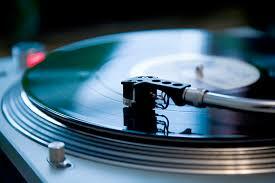 And vinyl is not just about the music, but the sleeve, the lyrics and the engagement that's needed. In other words its more holistic. Recognising that the patient has a family, a past, a hoped for present and future, and that the patient has vulnerabilities that the doctor may not have and has a context that the doctor needs to know. And all so as to make the doctor-patient interaction more effective on both sides. Greater satisfaction for the doctor and perhaps an increased ability to cope with whatever dysfunction the patient is facing. And what about the crackles? Gosh they are important. They remind us of the vulnerability and fragility of the human frame. Easily broken, sometimes irreparably so. And its good to be reminded of the vulnerability of the doctor. We are not superhuman. We do make mistakes. But where mutual trust and genuine holistic care exist, our patients are generally so forgiving.